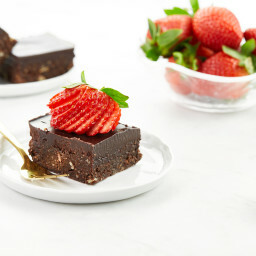 We’ve been having a total love affair with these raw brownies for the past couple weeks. A little nibble here, a little nibble there. I’m actually amazed that they’ve lasted this long, but just a small square is enough to satisfy my chocolate cravings. That’s how you know a chocolate dessert is the real deal. Plus, if the dancing in my belly is any indication, they are a big hit. Lately, our evenings go something like this: We put on the hockey game (we’re avidly following both the Pens and Habs series which is basically another full time job) and I’m on my laptop doing some nursery planning as I scream at the TV. Eric is searching the freezer for these brownies. Nursery planning leads me to the uneasy discovery that I have zero home décor ability (not to mention decision making skills), but I still hold onto the hope that I can turn the room into the DIY nursery of my dreams. I curse those picture perfect rooms on Pinterest as I eat my brownie and watch hockey. Eric reassures me that the dresser we picked up at the second hand store is going to be transformed into something amazing for the baby’s room. I’ve always wanted to be a crafty goddess, so now I’m excited to start this project and see what I’m really made of. And O.M.G., these brownies. This raw brownie dough is made up with protein-packed hemp hearts, walnuts, Medjool dates, raw cacao powder (cocoa powder works too! ), vanilla, and Himalayan sea salt. Just throw it into the food processor and voila. To add some crunch, I pulsed in some cacao nibs and chopped walnuts. The crunch is essential! The result is a chocolaty brownie-like dough all without the using the oven, flour, sugar, or butter. But I didn’t stop with the brownie dough. Of course not. Go big or go home. I poured on homemade chocolate for a second layer. The chocolate hardens into a thick shell, giving these brownies a wonderful snappy texture – best enjoyed straight from the freezer. The contrast of the firm chocolate shell and the chewy brownie is just heaven! This recipe is quite versatile though so have fun playing around with it. I imagine you could make several different variations on these just by changing the nuts/seeds, extracts, topping, etc. Who knew fudgy, decadent brownies could be so packed with protein, omega-3 fatty acids, fibre, and antioxidants? Don’t let the healthy, wholesome ingredients fool you though; these no-bake brownies will blow your mind with their intense chocolatey flavour and satisfyingly dense, chewy texture. Recipe inspired by Sweet Talk Blog. Line a 9x5-inch loaf pan (or an 8-inch square pan for thinner brownies) with a piece of parchment paper, leaving some overhang to remove the brownies in one piece. Place 1 cup of walnuts into a food processor and process to a fine crumb. Be careful not to overprocess, as too much break-down will turn the walnuts into butter. To the food processor, add the hemp seeds and pitted dates and process until finely chopped and sticky. Add the cacao powder (or cocoa powder, if using), vanilla, and salt and process until thoroughly combined. The dough should be slightly sticky; if it’s not, add water one teaspoon at a time and process the mixture again. I often add 1 to 3 teaspoons of water to achieve the right consistency. 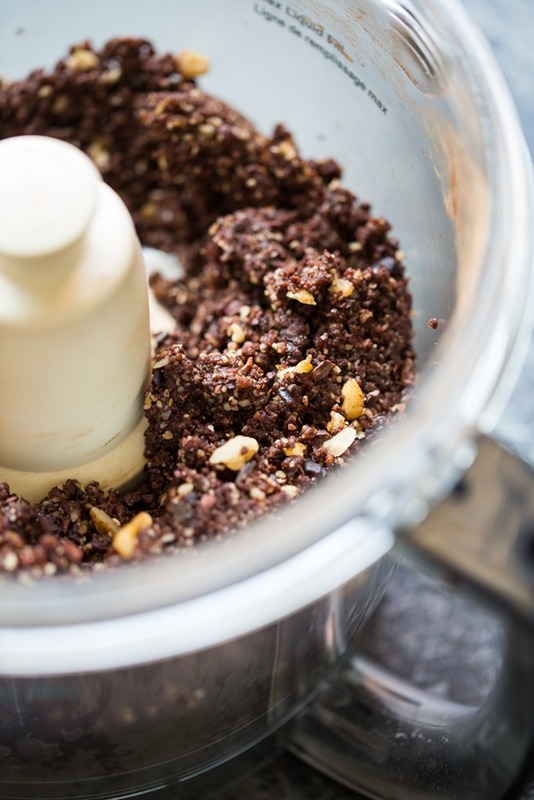 Add the 1/3 cup walnuts and 2 tablespoons raw cacao nibs (or additional chopped walnuts if using), and pulse the batter until just combined. Spoon the mixture into the prepared pan and spread it out evenly. If you have a pastry roller on hand, you can use it to roll the dough until smooth on top. Otherwise, simply press the dough down with your hands and ensure the edges are even. Place the pan in the freezer for about 10 minutes. Prepare the homemade chocolate: Melt the coconut oil over low heat in a medium pot. Remove the pot from the heat and whisk in the cacao powder (or cocoa powder, if using), syrup, salt, and vanilla until smooth and thoroughly combined. Remove the brownies from the freezer and pour on all of the chocolate topping. Carefully transfer the pan back to the freezer and let rest on a flat, even surface. Chill uncovered for at least 20 minutes, or until the topping is firm enough to slice. You might find the homemade chocolate will freeze a bit unevenly, but this is normal! To remove the brownies, run a knife under hot water for a minute or so and carefully slide it along the ends of your pan to loosen the slab. Using the excess parchment paper, lift the brownie slab out of the pan and place it onto a cutting board. Run the knife under hot water again and wipe off excess water. Pressing the knife down slowly, slice the brownies into squares. Top with strawberries, if using. Leftovers can be stored in an airtight container in the fridge for several days, or tightly wrapped and frozen for 1 to 2 months. You can enjoy the brownies frozen, chilled from the fridge, or at room temp...your choice! I personally love them semi-frozen. Nutritional info includes homemade chocolate topping. * You’ll want to use soft, fresh Medjool dates for this recipe to ensure your batter is sticky enough. If your dates are firm, try soaking them in water for 30 to 60 minutes—drain well and use as directed. ** Instead of the homemade chocolate topping, you can melt 3/4 cup non-dairy chocolate chips in a small pot over the lowest heat, stirring until smooth. OMG Brownies indeed…how do you stop at eating just one though?? These look dangerous to have around — not that it will stop me from making them! They look like a little piece of chocolate heaven! Love a good vegan brownie! Oh yuuuuuuuummm! I have given in to way too many pregnancy cravings lately, but that’s okay. This recipe is going on my to-make-asap list. :) Hope pregnancy is treating you well, Angela. Thanks for all the amazing recipes! I don’t know how I still haven’t tried raw brownies, but these are definitely going to be my first attempt. The chocolate on top!! I have faith that you will be the DIY goddess you want to be and the nursery will look great! Ohhhhh yummy! Can’t wait to try these! Nursery planning can be so stressful. I went to Pottery Barn Kids and they told me they offer in-home design! A consultant came over, measured the room, talked ideas, colors, layout, wants, needs and everything in between. By the end I had a Pinterest board and floor plan made for me. It was such a huge help and relief! Finally – a recipe that doesn’t make me feel like a terrible person for eating raw brownie batter! Yum, these looks amazing! I made a similar raw brownie this winter, but added in tart cherries. Um, YUM! I cannot wait to make these. I have also dropped MANY hints that what I want for Mother’s Day is the OSG cookbook. Here’s hoping he takes the hints and that he can find it in our town! You will have a lovely nursery. I didn’t put one together for baby #1. . . he was in our room for quite a few months anyway. For baby #2, I finally organized, and though it’s not all matching it finally looks like a “kids” room. Not sure what we’ll do with baby #3 on the way. But I’ve shifted from nursery, to focusing on play room at this point. One you decide color scheme and main features, you can sift through pinterest pretty quickly. If you don’t have a houzz account already, I found that much more useful – pinterest is too much like a rabbit hole to me. My point is that you can get by without a formal nursery. . . but I’m sure whatever you come up with will be fantastic. Good luck – but please keep coming up with yummy treats to share with us during the decision process. We all appreciate it!! Wow – these look incredible!! They look really similar to a brownie I had a few weeks ago from my favourite cafe – Wild Food Cafe (in London). Anyway this brownie was amazing and I have been craving one like it ever since so thank you for this recipe!! I will have to get making them soon!! Those brownies look so good, though I’m not a fan of hemp seeds (there’s a flavor I just can’t get past). What do you suggest to replace the hemp seeds? Also, I made a double batch of your other brownies last night (the brownies 2 ways recipe–I made the first recipe) for a work lunch…and I tasted them this AM and they are so so so so delicious and decadent. Not sure if you’ve seen the blog Young House Love. They have 2 kids now and have done blog posts on both nurseries/bedrooms…they may be able to offer some helpful DIY ideas. Not to add to the obsession, but I’m sure whatever you do will be fantastic. Angela’s word should be the last one on this, of course, but I suspect you could swap in chia seeds, sunflower seeds, an almond/flaxseed combination, or walnuts, depending on what you like and what you’ve got in the house. I was wondering the same thing about what to sub for hemp. What did you end up trying? Thank you, Angela – it’s a really delicious recipe!! I was wondering about something to replace the hemp seeds for as well, did you come up with something? my belly would dance if i ate these, too. they look amazing, angela. i think i’d be feeling the same exact way as you planning the nursery. i am such an indecisive person. This looks like it is amazing! Those 2 layers instead of one?! I’m in! These brownies look amazing! I am making them for sure! So happy to know that you are doing great with your pregnancy, good luck with the baby room! These look amazing! I saw that my local Bulk Barn is now carrying bulk cacao nibs and I almost had the happiest panic attack of my life!! I think this is the first thing I’m going to make with them! Wow, this looks heavenly! I can’t believe it’s raw and vegan! Mmm…Love the two layer thing you’ve got going on! Why go for one layer when you can have two?! could we use carob powder or melted carob chips for this? Or is the cacao a “healthier” (or less processed) choice? thanks! I’ve been a little hesitant to try a healthy brownie recipe, but these have definitely convinced me….I mean 2 layers of chocolate?! Yes please! ooooh this looks wonderful! I move with my boyfriend soon and he hates chocolate things….so I need to get it out my system! These look relatively healthy for you too so I do not have to worry about it sabotaging my half marathon goals for a few weeks! Thanks Angela! These look so great! I love that they’re raw and only a few ingredients! I wanna add in some raw almond butter to the topping! They look like winners! My very first ever post that I blogged about over 5 years ago was Raw Vegan Chocolate Brownies made with dates, walnuts, cocoa, agave, vanilla…similar ingredient list. With raw desserts as you know, there’s so much flexibility. Just dump it in the food proc and see what happens :) Yours are perfect & pinned! I love the taste of raw chocolate and these brownies are looking so good! I love the lighting for this post’s photos. It’s kind of moody! Very cool. I don’t really like cacao nibs on their own, so sweetening them up with the dates is a great idea! And my sister-in-law totally did the same thing with the nursery planning. I think it’s called “nesting.” There is so much cool stuff out there, I half wonder if I should transform my bedroom into a nursery! Hi Angela – any nut free brownie ingredient suggestions that would work well with this receipe? I made these immediately because I have really been wanting chocolate lately. I’ve never had a raw brownie before and these were absolutely wonderful and I enjoyed it tremendously! I followed the recipe exactly and I will definitely be making these again and again. Thank you so much for this fantastic recipe. I am confused as to why the walnuts are listed twice. Is that a typo or supposed to be another ingredient for the 2nd walnut listing? These look great! The large amount is for the base, they essentially get processed into powder. Then the second bit is for texture and chunks in the brownie….is how I figure it anyway! Heading into the kitchen to make these NOW. These look absolutely amazing! Love raw desserts-the more chocolatey the better! Hey yay! Two layer raw brownies!! I just transitioned into a raw diet and I think I might make these asap! Thanks for the idea Ang! Go food blogger go! PS – I’m loving your baby page! If you have time get your hands on a copy of Joel Robbins book Pregnancy, Childbirth & Children’s Diets. Best read a healthy woman could…read!! These look delicious! I’m always looking for a satisfying healthy chocolate treat. These look amazing! Brownies are my absolute favorite. What would you substitute for the walnuts? These look yummy and me and my pretty belly are sad we don’t have the ingredients on hand…maybe this weekend. If you are looking to cultivate some DIY skills, the blog Young House Love is great. They have done 2 nurseries and they’ve redone dressers, painted etc, so they have great tutorials and it’s all real things they do to their own house so you get an accurate cost breakdown and time commitment. These look totally amazing, I can’t wait to try them. I’m going to try a variation without nuts for a nut free friend, I’ll go for seeds and do you think some dried fruit might work? Ok, I’m pretty sure I’d mow through an entire batch of these on my own if they were in my house! I love how you’ve mixed so many healthy and delicious things into the dough, and that they’re flourless too! As for the nursery, knowing the DIY prowess and creativity that you and Eric share, I’m sure it will look absolutely stunning when you’re done! Loving this soooo much! And I especially like that hard shell on top! Yum! “Store leftovers in the freezer”. Leftovers. Hahahahahahahahahahahahaha. Yum! These looks absolutely delicious. The topping looks so good too.. Now I need to make a batch! Hi Angela, the raw chocolate brownies look absolutely delicious! 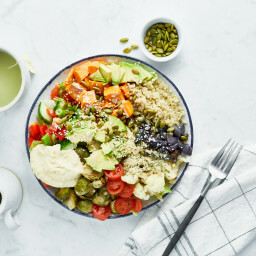 What could I use as a substitute for the hemp seeds? I live in Singapore and I haven’t seen hemp seeds in shops here sofar. Thanks so much & take care! I can’t wait to try these!!!! Thank you for the inspiration! Could you use a vitamix to create the mixture instead of a food processor? You presented this so well with your photos! Well done! The brownies…the milk – superb! Daft question… So, in practice, is there any difference between using cocoa powder and cacao powder? I know cocoa isn’t raw, but do they behave differently? Slightly different flavours. Cocoa is a bit more bitter. Made these last night to bring into work today! One word: YUMMMMMM. I used cashews instead cause that’s what I had and I don’t love walnuts. So essentially it’s like a chocolate version of the cookie dough Lara bar recipie which is my total fave. Sooooo yummy!! These look like something I will be eating an entire pan of,…OMG yum! Angela, we live parallel lives, only instead of planning a nursery I’m planning a college graduation for my first baby. What?! Tonight my hubby, son, and I will be cheering on the Chicago Blackhawks while eating some of these amazing looking raw brownies. I’ve made a baked vegan brownie, but I haven’t ventured into the raw zone yet. Today is the day! Thanks for sharing this, can’t wait to try them. Could I substitute raw sunflower seeds for the hemp seeds, which I don’t have? Woah these sound crazy good. I think they will be PERFECT this afternoon when it gets p to 86F here, pull out of the freezer and enjoy brownie goodness! Oh and hockey, in the past 5 years I have come to LOVE this sport! I didn’t grow up with it but I am a convert. It is just so exciting! As for the nursery I recommend Young House Love’s blog, they always make me feel like I am capable of anything! These look fab! And…another reason why I need a food processor in my life.. I too am both a Habs and Pens fan! Your household sounds exactly like mine, that is too funny! When I first saw your blog post about these brownies, I was like, Oh oh, something else I can’t have with my limited diet, but surprisingly, most of the ingredients I can have! I can’t wait to make these, what an awesome treat to have during those exciting (stressful) hockey games! heh…yea, when our Leafs didn’t make the playoffs we decided we still wanted to watch a couple good series so Habs & Pens it is! And what great series they’ve turned out to be. Enjoy the brownies if you make them! I need to figure out a sub for the hemp. Other than that…I’m looking forward to trying these!! I want to try and make these into Truffle Balls–do you think that would work?? Just sounds so GOOD! I can’t see why not! If the dough doesn’t stick enough just add a small splash of water. These look divine! I love making raw truffles and yes changing up the nuts and seeds makes them so versatile just like these lovely brownies! I love the melted chocolate layer though…that’s the bees knees – must try lol. I also love that they are packed full of omega-3s, so amazing for your little one! Um, Ok. I made them and they are amazing. I believe I said “Holy $*it” these are good” out loud to myself while shoveling brownie dough in my mouth straight from the food processor. Everybody, stop what you are doing and go make these. These look delicious. And relax — babies don’t give a hoot about nurseries. Worrying about decorating one if it’s no fun for you is a total waste of psychic energy. All little ones need is love and nurturing and a place to sleep. The rest is window dressing for the neighbors. I’m actually having a lot of fun planning it! 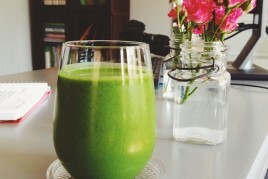 I love that you are incorporating raw recipes too! Thanks! The Live Well Network has a great show called Knock iI off by two well known DYI bloggers Monica and Jess ujst in case you need some help. They have helped owners do amazing redesign projects with what ever budget they have. You can email them questions or ask for specific advice. OMG! I just make these! They are SOOOOOO good! Thanks for the recipe! I made the bottom portion of these minus the cacao nibs and the salt. They were wonderful. The recipe is a keeper!! I don’t think you need any topping at all and without the topping they are very low in fat. I forgot to mention that I used Penzey’s full fat cocoa (not dutched), which is not only delicious but a better source of antioxidants than the dutched variety. Just made a half batch of the brownies. They are awesome! Very rich. The chocolate topping really steps it up from just a typical raw ball/Larabar clone to legit dessert. Good work! Have you ever tried brownies made from kidney beans? I was shocked at the flavor and they reminded me of raw brownies! Yours looks fabulous! I made these brownies today and they are soooo good. I had one this afternoon and two more in front of the TV this evening :o). Awesome recipe. Thank you so much! I neeed these asap! They look incredible! :D happy mother’s day! I’ve already eaten two squares and I’m trying to distract myself from getting up and eating more. :) Great recipe, I can see myself making these when the weather gets hotter and I don’t want to turn on my oven. I made these last night and they were amazing. I’ve tried a lot of other raw vegan brownies recipes and these were by far the best. Although the other recipes have been good, the biggest problem I have with other recipes is the texture. These brownies are the perfect texture and the flavor is perfect! I also made two batches of the ‘our favorite veggie burger’ and the ‘Indian lentil-cauliflower soup’ from the cookbook last night and they were also amazing. I’ve been making a batch of the soup each week since I bought the book and still look forward to it every week. My fiance has started adding sriracha since he likes really spicy food and said it fits perfect with the flavor of the soup. Oh my gosh! I just made these for my mom for Mother’s Day and my whole family is absolutely in love with them. Thank you for the recipe. Also wondering, along with several others it sounds like, about substitutions for the hemp. Better to just leave it off altogether? Substitute sunflower seeds? flax? something else? Angela! These look amazing. Can’t wait to get back home and make these!!! These are really, and I mean really YUMMY! I shared them with my friends and they loved it too. They couldn’t believe the recipe is without refined sugar and other unhealthy ingredients. Thanks a lot! I’m off work today and just made these! Can’t wait for them to be out of the freezer and in my face with a cold glass of hemp milk… omg *drool*. Love all your baby news and information – thanks so much for sharing, I can’t tell you how helpful it is!! I made your brownies for my familys’ mothers day treat. My dates were indeed hard so I tried to soak them but I thought what the heck toss in some water then I read at the bottom of your recipe not to do that…Oops But They were friggin (scientific word:)) great, anyways. I froze mine so when I cut them the chocolate on topped chipped , which means they did not cut uniformly square like your picture(because they were frozen to harden the soft watered bottom layer). Doesn’t matter we ate them and a strawberry pie and a blueberry pie thingy I made as well. These look heavenly! I can only imagine the perfect balance of creaminess to crunch! Made these over the weekend! Excellent! My non-vegan parents loved them! Oh my WORD – I just made these tonight and they were a BREEZE. Came together EXACTLY how they appear in the picture. It was my first foray into a vegan dessert (I have been doing Whole30 and just transitioned into full paleo lifestyle). I was worried that I would be tempted to eat the whole pan. NOT going to happen!! These are gloriously RICH and I could not eat another one (I am a huge chocolate lover) – Literal perfection. Due to a walnut allergy, I chose to substitute pecans, and I opted to include the cacao nibs and extra nuts into the brownie part (optional in the recipe). The chocolate on top is smooth and rich. Anyway, I could go on and on, but these will be my go-to treat to keep in the freezer. THANK YOU!!! I bought something a little similar to this from the supermarket yesterday and it was tasty but … I was thinking that it was a bit small and needed a bit of bite or crunch. So this recipe is perfectly timed! Pinning! Made these last night without the chocolate topping. They are perfection! Love them. Hi Angela – as usual, these look amazing. I have a quick question: I preordered your book and got the bonus recipes in a pdf which now won’t open. Is there any way to get it again? Just wanted to say that I used to be a regular reader of your blog. I have been less-available lately with my senior year of college. I went on your blog today to catch up and explore and I discovered you are pregnant! (I know I’m a little late) but I wanted to say congratulations! Keep up the good work. This recipe looks amazing, of course. These are divine and the first time I’ve tried raw brownies. Needless to say, I’m hooked and I’m guessing my husband is as well since the freezer is the first place he goes when he gets home! Thanks for another, stellar recipe!!!!! One of my (pregnant) friends recently mentioned to me that an active baby after eating something could be a sign of a dietary sensitivity of the baby. Maybe something to keep an eye on! Mmmm these look so good!!! It’s funny – you say you aren’t crafty and yet I always seem to picture your house as a Pinterest Perfect setup ;p I bet you’re not as bad as you think you are. I made these for Mother’s Day, and everyone loved them! My mom (who usually thinks my desserts taste too “healthy”) enjoyed these so much, that she asked to take two more home for later in the week. Thanks for a delicious recipe. Wow, these are SOOOO good. I couldn’t believe it! I dumped a little maple syrup into the bottom layer too, which made the mix a little sticky/chewy instead of more “lara bar” like, but it’s a big huge hit here at my house (and I live with serious chocoholics/sweet tooths). These look so good. Always nice to have healthy (and vegan) treat options! Made these for myself and my family for Mother’s Day and they were a hit! I bought coconut oil for the sole purpose of trying out your myriad dessert recipes. Clearly, I was just in time. So I did make these, and my husbands top quotes about them were…”Best brownie I have ever eaten!” and “Seriously, these are Vegan?”. He did buy me your cookbook for Mother’s Day. Pretty sure these Brownies made him excited about that purchase! Thanks! I made these last night and they are delicious! The perfect little treat! I only had 1 cup of walnuts so subbed in pecans for the 2nd 1/4 cup. 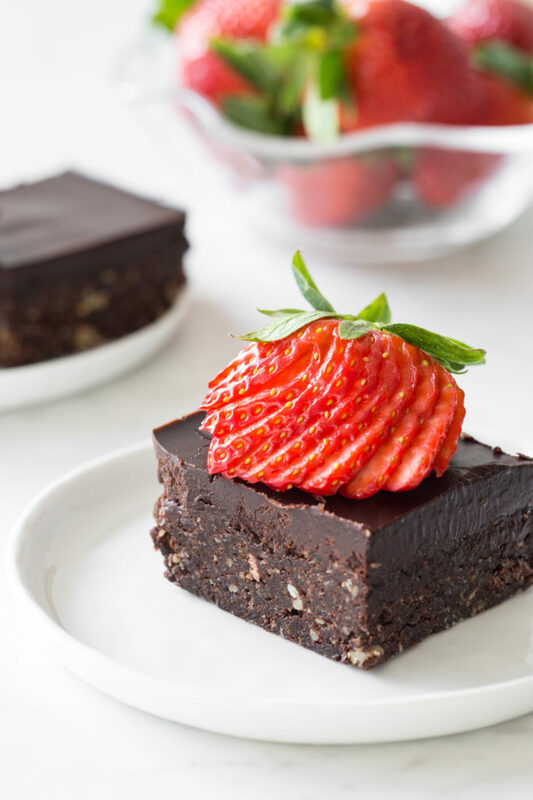 These brownies are in the top 5 vegan foods I have EVER made…and I’m a long time vegan! Can’t say enough good things about them! Awesome recipe! Thank you for using so many pictures in your posts, it makes it a lot easier for us to follow along as we prepare these brownies. Yum, this looks so good! I love brownies and I love anything raw. Thank you for the recipe! I am celiac, and try to avoid dairy so these are great! Thank you so much I officially have my favourite brownie recipe ever! Angela – these brownies are delicious and decadent! I took a look through your cookie recipes and wondered if you have posted anything on quinoa cookies? I had a soft,chewy cookie yesterday that was quinoa, almond, cherry. With cherries being in season right now, I would love your take on a cookie like this! Very much enjoying your book! Thank you for the beautiful recipes! I have made these twice now and they are too, too good. The second time I ran out of cocoa powder, so I made the top layer with melted chocolate chips, coconut oil, vanilla, and salt. It works, but I prefer the original recipe. They are a perfect chocolate fix. Very chocolatey, very rich, and somehow also packed with nutrients. I love them a little too much, I think. Made them this afternoon–absolutely freakin delicious! Can’t keep my kids away from them. Another home run Angela. I made these yesterday and my husband and new bosses were all blown away with the flavour. Thank you for your creativity. Wow Angela, these were such a home run. We all loved them and had to stop ourselves from eating ourselves sick. Great job, great creativity. Hi…what could i sub in for the hemp seeds? I used sunflower and sesame seeds instead of hemp. Wow! You’ve done it again. Just made these today and eaten the first one, and they are to die for. These are so good and easy. I love the ingredients and I love that they are raw! Thanks for another keeper! These are GREAT, Angela! They don’t give me the sugar crashes that I have with regular sugar. I’ve been trying to stay off refined sugar the past weeks to see what it does to my skin and mood, and your brownies have helped me do it :-) Thanks!! Btw, I used pecans instead of walnuts (for some reason walnuts make me feel sick) and it worked out perfect! I just made these – oh my god they’re delicious! And so easy to make! I couldn’t find the hemp seeds so I used linseed and my dates were dried so I softened them for 2 minutes in hot water. Definitely recommended! I made them with a mixture of sunflower and seasme seeds instead of hemp. They turned out amazing. Thanks for the great recipes. These are so good! I made them a couple of days ago and I can’t stop snacking on them. Thank you for so many terrific recipes! I have made these brownies twice now for my family and they are a MAJOR hit with a husband who is a chocaholic, and two little ones who keep a “clean” diet. The first thing I thought after trying one is “who cares if it’s healthy???? It’s awesome!” The only change I made was with the second amount of walnuts… I simply chopped them up and put them on top of the bottom layer and then spread the chocolate top layer over it. Amazing! Thank you so much for all you share with us. Man, these look so good but I tried it and failed! As I was making it I wondered how is this going to work with such small amount of liquid? (just vanilla extract?) My food processor and vitamix couldn’t handle it. so I ended up trying to mix it by hand. It just ended up clumpy and very dry. I couldn’t get it to mix so eventually I added applesauce and a banana. Still too dry! so I added some coconut oil. It’s not bad but not great :/ I wonder if there is an ingredient left out of this recipe? or did I miss something huge? Do you just need a really high powered food processor? Yes you definitely should use a sturdy food processor for this recipe and not a blender. There aren’t any ingredients left out. Hope you have better success next time. Just curious – which brand of food processor are you using? My Tefal blender comes with a mini grinder and chopper that aren’t exactly power houses. So I did the nuts and dates separately (and just a few at a time), and then mixed everything really well by hand in a bowl, along with the rest of the ingredients. Seemed to work fine. Hope that helps, as they are so so worth the effort, being pretty much the best thing I’ve ever eaten. Just made these – just Fabulous! The challenge will be to limit myself to 1-2 of these bad boys/day. Should be called “Not Yo Mama’s Brownies”. They’re better – and infinitely more satisfying. These brownies nearly burnt out the motor of my food processor and then were very hard to spread. I was thinking that maybe they weren’t worth it, but I just tasted my first one and they are so worth it. Thanks so much for the great posts and the cookbook. I enjoy it all and am a faithful follower. These brownies are AMAZING!!! Talk about death by chocolate, wow! The coconut oil in the homemade chocolate gives it a nice coconut flavor along with the intense chocolate, love it! Also, I only ate one brownie and feel very satisfied. I have a huge sweet tooth, especially when it comes to chocolate, and these brownies did the job and then some. I made these awesome Brownies yesterday and everyone loved them! For future reference, I made them mostly one-handed with my 8 month old baby on my hip!! These came out phenomenally. I didn’t freeze them, just kept them in the fridge and they came out perfect. This is my go to recipe for chocolate brownies now. I love that I can eat one, feel satisfied (the texture of the brownie is so similar to fudgey brownies and the chocolate on top is SO GOOD) and I don’t feel that sick weighed-down feeling I would get after regular flour brownies!!! I would add some organic sprinkles to the top or raspberries while the frosting is still cooling. So good. Thanks for sharing!! Can I say wow! Just had the first finished bite. Wholesome, dense, chewy, with brownie taste! Don’t skip the salt; it’s essential. I used a slightly smaller pan, too, so they could be thicker. I’m so excited to have my freezer stocked with these! Oh. My. Goodness. These are seriously good! Just made these tonight and they are absolutely delicious! I’ve been craving brownies (the kind with white sugar and white flour) but I’m trying to stay away from that stuff. These definitely satisfied my cravings! I’ve never tried one of your dessert recipes, but it’s safe to say that I will be trying many more, and soon. Thank you! We make ‘energy balls’ (essentially the brownie base recipe in balls) all the time but I never thought to add a chocolate top! How silly of me not to think of adding chocolate- chocolate goes with everything! I’ve been making these brownies since they appeared on your blog time and time again. They’ve become a staple in my house, as soon as we run out of them I make another batch. They are delicious! We are loving these- I am a southern girl so using pecans not walnuts:) Also just using the brownie recipe to make little snack balls. No icing needed these are so delicious. I use a small cookie scooper , freeze as advised and then store in refrigerator. My kids and I make this one all the time! I love that they gobble them up after we make them together. It is so satisfying to give them a treat that is healthy for them. My favorite brownies!! I’ve made them many times. I’ve made these a bunch of times and they are delicious! I also made the original recipe from the sweettalk blog and this one is way better. I just made these and they are incredible! My mum said these were the best brownies in the world ahah. However, I had some problems making them since my medjool dates weren’t very soft: you really have to soak them before attempting the brownies! Firstly I love you recipes on the site, but am in love with your cookbook!!! I had a quick question, do you have any suggestions for replacing the oil portion of the frosting? 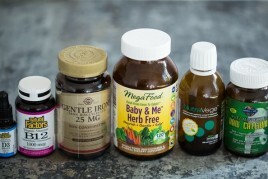 Can there even be an alternative (trying to reduce oil intake in my diet)? Just made these super tasty brownies. Totally killed my chocolate craving which is hard to do. Will make these again especially because the recipe seems forgiving and I can try variations. Just made these earlier today and they are amazing. I decided I wanted “brownie bites” so since we aren’t 100% vegan (YET!!) I added a couple tablespoons of honey to the dough so it would hold together a little better, scooped and rolled into one-inch balls, froze, then dipped in the chocolate. Soooo yummy!! Oh, and I did swap 1/4 cup of the raw walnuts for raw cashews because I ran out of walnuts. But I think I shed a few tears when I ate the first one! Okay so these are so good that I adapted the recipe into smaller servings/one serving size so I don’t eat too many…they’re that good…I have to restrict myself! Thank you for the best brownie recipe ever. I just made these brownies and my husband devoured his square and declared them “magical.” Best dessert he’s enjoyed in a long time! Thanks for such a fabulous, healthy, and easy recipe! The brownies were delicious and very quick to make. Just a perfect combination of flavour and sweetness, and the protein content is a nice bonus. t I did find the chocolate layer a little too sweet, it took away from the brownies. Next time I might only use half of the top layer. Having said that, the sweetness might not be a bad thing, I did stop eating after two brownies instead of having the whole thing. These are so good! I made just the bottom layer and shaped them into little balls that I keep in the freezer. They really do taste like brownies. Thanks for sharing this recipe! I made these last night and Oh My GOSH! Died and went to brownie heaven… Thank you so much for this beautiful recipe! Its bliss! Perfection. I normally don’t really like desserts with dates, but these brownies came out perfect. The bottom was very fudgy and rich with a crunch, the top had a nice snap. I found one whole square to be a little too much, so I cut each square into four little squares, so you get a ton of bite-sized pieces. I’ve made them twice so far, and everybody who tasted it loved it! Hey, they look amazing – can’t wait to try them! It might be a silly question – but can they be frozen for up to a few weeks? These are THE best brownies I’ve ever made! I used raw cashews (soaked a few hours) instead of walnuts and also used raw macadamia nuts for the chopped nuts. I did soak dates as suggested and used the cream from the coconut milk. I replaced hemp with ground flax seeds. I never left a review before, but as I’m making these now for the second time, I feel they’re more than worthy of a review. I may add some coconut just for fun. Another reviewer said she used cherries and that sound delicious. Thanks! 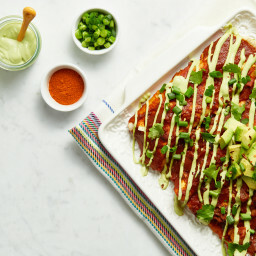 Thank you so very much for posting this beautiful vegan recipe. Gluten free is a huge plus for me and any recipe to help the animals is wonderful. Go Vegan! For the animals! P.S. 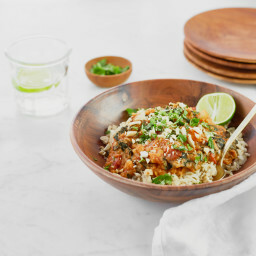 Is it just me or does anyone else find it so annoying when looking at reviews for recipes and all the comment says is how good they look or can’t wait to try? I love reading how others made their version or any extra tips and if they liked how the recipe turned out. Not that they are going to try the recipe someday. Sorry for the little vent. I totally agree! I don’t want to waste my time on reading how good the pictures are. I can see it myself. I am really happy for Angela, that she has so many followers, but I think commenting on the pictures is not necessary. People, try those recepies, they are good! Would banana be an appropriate sub for the dates? OH MY GOODNESS!!!!!! I just made these and they are HEAVEN ON EARTH!!! I was a little unsure of myself when I first began making them as I tend to have bad luck when it comes to any sort of “no bake” recipes. But these….these are absolutely divine. I have a super cheap blender, but I was still able to mix everything together by blending only a tiny bit at a time (took a while, but was well worth it!) I am so blown away by this recipe, the fact that it has no refined sugar, no flour, is completely raw, 100% deliciousness and EVEN GOOD FOR YOU! Sorry for all the yelling….I’m just really excited over this :) Thank you for sharing with with the world! After making these the first time I have to have some of these in my freezer all the time! These are my go to chocolate treat and I have made them with pecans when I ran out of walnuts and they are just as delicious! Thanks so much for allowing me to have a guilt free treat to satisfy my cravings and still feel healthy! I WAS ABLE TO MAKE THESE IN MY OWN HOUSE WITHOUT AN OVEN, AND WITHOUT A WORKING FOOD PROCESSOR! It was a bit of a pain, but I used my blender for the walnuts and hemp seeds, and then mixed in the dates with my KitchenAid stand mixer with the beater attachment… it still worked! Mine are pretty gooey, probably because I didn’t drain the dates well enough, and I even used 1/3 raw cacao in the base, instead of the 1/2c, and they are still BEYOND delicious! I cut them into itty bitty, teeny tiny squares, and you are absolutely correct: a tiny dab will do ya. Even my super-finicky parents love these! I say: WINNER. These are awesome! Made mine with raw almonds and sunflower seeds and reduced the amount of maple syrup. A small bite goes a long way as they are very dense and chocolatey. I’ve left mine in the freezer to make it more work to get to! I have always been a huge fan of all your recipes, but this one is my favourite by far! They are easy to make and taste soooo yummy! I make these all the time, they are my go to dessert! Thanks for sharing such an amazing recipe! These brownies are fabulous! I keep a batch in the freezer to grab whenever I need an immediate chocolate fix! Tonight I made your ‘Almost Instant Chocolate Chia Pudding’ and spread some of it on top of the brownie, it made a great smooth and chewy chocolate treat in 1! Love your recipes and your blog! Just made these again for about the tenth time–I think they might be my favorite recipe from this blog! Definitely make the top chocolate layer, that “snap” takes it over the top. Hello, fellow Habs fan! Thank you for sharing this recipe, as a die hard fan of chocolate, I will definitely give it a try! 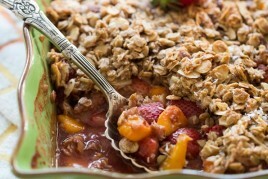 I love your granola bar recipe and the banana bread muffin tops (and my kids too, by the way!). I ALWAYS see recipes calling for a food processor, but I don’t have one and they’re really expensive. Is there anything I can substitute it for..like a smoothie blender? I’m a total brownie addict! I have the perfect caramel sauce to top these brownies with. Thank you for the inspiration. Just made these! So tasty. I subbed non-dairy chocolate chips for the homemade chocolate sauce because I was lazy. Loved the crunch from the cacao nibs. Another great recipe, Angela! I can’t believe how much they taste like regular brownies — even right out of the freezer! No need to even wait for them to thaw like most raw desserts. And so many healthy ingredients. Having these in the freezer as a healthy and satisfying treat when needed is the best! Hi Angela, what a delicious recipe! I had to make the brownies twice this week—my family and colleagues loved them so much! Keep up the good work! I have just made this substituting the hemp seeds with linseed (hempseed are really hard to find here in Australia) that I have finely ground and it is fabulous!! Am going to take it and share it on a metta retreat this weekend. So very appropriate… this is definitely loving-kindness in a square!! Anyway I could make this fit a 16×9 pan? The brownies turned out very thin in a 9″ square pan. I don’t think it would work as you would have to double the recipe. Couple days ago made it and I must say it was best brownies I have ever had! Even my picky kids loved it! I was eating brownies for breakfast, lunch and snacking in between. Got everything ready for making more today. Thank you for sharing such goodies! Oh my gosh! I just made these delightful brownies. So good!!! Great recipe to make in the summer as well (not using the oven is nice). I recently bought your cookbook and I am having fun trying out different vegan recipes. I decided to make this recipe instead of the one in the cookbook because it has no sugar!!!! A guilt free treat to curb my sweet tooth. Best brownies hands down! Wanted to make a cake for friend’s birthday but didn’t have enough time, or enough ingredients so I whipped these up and they were fantastic. Had to post them on my blog too! Thank you!! I have made the raw chocolate brownie recipe so many times. I adore it, so do my family and friends. I also recommend your site to my clients who often require healthy eating options. Thanks so much for your fabulous recipes. You clearly demonstrate that healthy is yummy!! I made these the other night and they are fantastic! You only need a little piece to satisfy and even the non restrictive eating housemates enjoy them. Thanks much for the recipe. These are divine. My family wanted brownies & I did not want to partake, so a handy search brought me here. Your recipes always save me! Thanks SO much! First time at raw brownies, turned out brilliant be great for a treat, a little bit salty though would definitely use less next time. Loved the crunchy bits (I used pecans in chopped nuts at the end) and you couldn’t taste the hemp seeds ! A definite keeper ! I just made these!! This is the best recipe yet!! I only added chopped pecans on top the chocolate before it set. It was perfect. I wish I could share the pic with you. Also. I couldn’t find my small springform since I halved the recipe so I lined a small round cake pain with plastic wrap and once it set and was solid (about an hour), it pulled right out. Oh. I substituted pecans for walnuts. Sorry, didn’t have any walnuts. It was fabulous. Hi Angela, I LOVE these brownies, and I believe I saw them in your protein-rich pregnancy sample meal plan. I’m wondering if you’ve done any research on the safety of raw cacao nibs during pregnancy? Yum! Granted, these don’t compare to “real” brownies, in my opinion, but as far as a healthy version go, they’re delish. I didn’t have dates so I used prunes with great results. Also added a little honey to the topping, though I realize that might be taboo. Thanks for the recipe. Hi there, I’m glad to hear the prunes worked out well! Thanks for the lovely comment. I made these brownies today (love!) and added some cinnamon to the chocolate topping. Wow, did it make the flavors sing–kind of gave it a Mexican chocolate twist. I’ve recently committed totally to a plant-based diet, and your site has been an inspiration. Thanks for all of the wonderful recipes! Hi Elizabeth, I am so happy to hear that my blog has been a source of inspiration for you. Thank you for the lovely comment, and enjoy those brownies! Hi Angela, a BIG Thank you for your recipes! we (my husband especially) love them and my 15 mos loves your green monster! Just a question, Hulled hemp seeds are actually unavailable where we are living, so do you have any substitution suggestion? They look amazing! I love the idea of double chocolate. Is there a substitution for walnuts? Hi Katie, You can absolutely substitute the walnuts! Pecans are definitely the most popular swap and lots of people have had success with it, but I’d think any of your favourite nuts would be a good choice. Peanuts, hazelnuts, cashews, almonds…all would add their own unique spin to the recipe. It’s a pretty versatile one! Good luck if you try anything, and I’d love it if you’d report back. I hope these satisfy the craving for you! Simply amazingly delicious!!! I just made these tonight and they are out-of-control awesomeness! Thank you, thank you Angela!! These are seriously delicious! I used 1 cup blanched almonds and 1/2 cup sprouted pumpkin seeds instead of the walnuts/hemp seeds and I am so in love. They taste so decadent it’s hard to believe they’re healthy! Salty, sweet and so DELICIOUS! Thanks for the recipe! LOVE everything on this website. SO good. My go-to for all recipes! Do you have any suggestions for making this nut free? Seeds are OK. I was thinking of replacing the walnuts with sunflower or pumpkin seeds, but since they both have strong tastes I wanted to see if anyone else tried this without the walnuts. Hands down THE best brownies I’ve ever had. I’m not a huge fan of brownies in general, but I always like having something I can snack on stashed away in the freezer, so I decided to give these a shot. They couldn’t be anymore perfect! They remind me of a little your super seed chocolate bites. Great recipe!!! Hi Efi, you can check out my Amazon store to see all my fave kitchen appliances, including the food processor I use. :) Hope this helps! Hello! I just made this and they’re so good! I replaced the walnuts for almonds. I’m wondering if peanuts will work too? Which food processor do you use? Your amazon link is down from the faq page is not working…. Hey there, Oh I’m sorry the link is not working for you! I’ll check on that. My food processor is a Cuisinart (it’s 11 or 14 cup, I can’t quite remember). I have to say I’ve had issues with it though. A plastic part on the lid broke, and there was a blade recall late last year. I’m not sure I would repurchase it as it seems like their machines got a bit cheaper in quality. The easiest, best brownies I’ve ever made! Modified the sweetness adding a little agave to the icing in addition to the maple, and also melted the coconut oil in the microwave after mixing the icing so it would pour on smoothly before freezing. The real test is, can a meat eating gluten eater enjoy this. Yes, I did! Thank you so much for the feedback Cynthia..so glad it was a hit! Could chia seeds replace the hemp seeds? Hey Katrina, I’m not sure that I would add a full half cup of chia seed to this recipe as it’s probably a bit too much (they are quite crunchy compared to help hearts), but you may be able to add more walnuts (maybe 1/2 cup?) along with a tablespoon of chia seeds? If you try anything I’d love to hear how it goes. NEW FAVORITE!! I had to make these immediately but was out of walnuts, so I did half almonds, half pumpkin seeds. I made it in a standard loaf pan and cut into 16 chunky squares. What a success! Just one really does the trick, they are absolutely delicious and without my asking, my husband said “we can serve these to guests” which is what I always want to know since we love to entertain – they are the perfect combo of homey and special. I keep them in the freezer and just let them sit out for about five minutes, that’s my favorite texture. THANK YOU! Aww Melisa, I’m smiling from ear to ear! I’m so glad to hear you both love them so much that they’re guest-worthy. And that’s great the almond and pumpkin seed swap worked! Thanks for your review. MAPLE SYRUP IS NOT RAW, EVERYONE. Hi Kit, Raw here means that the brownies are not cooked. If you want a truly “raw” brownie you can swap the maple syrup for a raw liquid sweetener.